When you begin to think of the holidays, no doubt your thoughts eventually turn to food. Wonderfully decadent desserts, treats, sweets and cookies make up a big part of many holiday celebrations. The common belief that no work is done on holidays couples with the consumption of a lot of tasty but unhealthy foods to lead to a sedentary enjoyment with our friends and family that can unfortunately pack on the pounds (and the fat). Accordingly, even the healthiest individuals can feel their belts, dresses, skirts and pants tightening during annual holiday celebrations. They rationalize away their unhealthy eating habits, promising to "get back on track" with a smart dietary approach to begin the new year. Unfortunately, their friends, coworkers and family members also indulge this attitude. This means fat-boosting, heart-unhealthy, energy-robbing foods are the norm when you get together to celebrate the holidays. Don't regret the start of the new year. 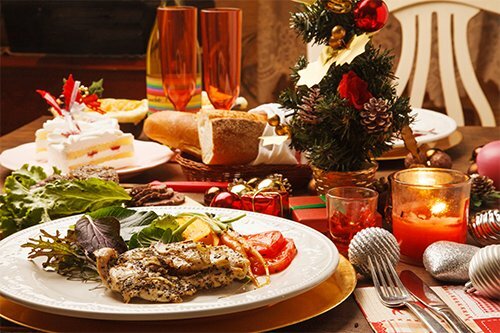 Take control over your eating habits when this year's holiday celebrations roll around. Eat as little as possible of the following top 5 holiday foods you should avoid for the sake of your waistline. Sauces accompany many holiday foods. Unfortunately, they are often filled with sugar, salt, monosodium glutamate, and tons of bad carbohydrates and calories. Limit your sauce intake during the holiday celebration to avoid adding inches to your waist. Okay, so these are beverages and not foods. However, many holiday get-togethers focus around consuming adult beverages. The sugar present in alcohol turns almost immediately to fat. Alcohol and beer both deliver empty calories. There is nothing wrong with enjoying a glass of wine, a mixed drink or your favorite beer when celebrating. Just don't overdo it, and you won't be shopping for bigger pants come New Year's. Okay, before you throw your hands up in revolt, think about this for a minute. Cakes, cookies and pies often claim sugar as a major ingredient. Many health experts believe sugar is almost single-handedly responsible for the obesity epidemic in the world today. Eat selectively, and enjoy your favorite cake or pie during the holidays. Just don't overdo it. Egg nog is a holiday season favorite in many cultures. However, 1 small cup of eggnog can deliver as many as 600 calories, and is filled with eggs, liquor, cream and sugar. Potatoes are not simple carbohydrates. However, your body treats them as such. This means over-consuming mashed potatoes, baked potatoes and fried potatoes during the holidays leads to fat gain. As with all of the above foods, eat in moderation. Pile your plate with whole grains, quinoa, raw fruits, vegetables and seafood. Eat a salad with light dressing before you hit the Christmas party. Eat as much meat and poultry as you like, but skip the gravy. These simple tips, combined with avoiding the foods mentioned above, will keep you from having to buy "fat clothes" when the holiday season is over.